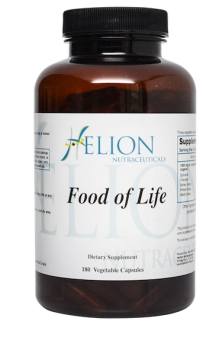 Food Of Life is a balance formulation of the most day to assimilate, nutrient dense micro plants on the planet. One way to make sure you are receiving the nutritional benefits of multiple servings of plant is through green food supplementation. Food Of Life has more greens per serving than other leading green food formulas. Other formulas often load their products with non-greens and fillers. While many of these non-greens are important and have a definite nutritional benefit, no other type of food source provides the nutritional benefit of green foods. Food Of Life provides vitamins and minerals as nature intended, but it goes beyond just that. Food Of Life also delivers naturally occurring cofactors and synergistic compounds by utilizing whole food concentrates which no chemical extraction has been performed.For optimal health, there’s nothing better than nutrient-rich, unprocessed whole foods in their balanced, natural state, like those found in Food Of Life. Food Of Life is perfect for all ages and health conditions. Food Of Life is taken 3 capsules 1- 3 times a day with or without food. 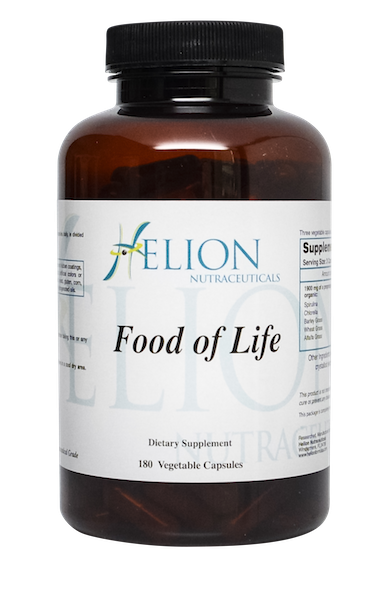 As with all Helion Nutraceutical products: Food Of Life contains no ingredients that are not nutrients. This means it has: No fillers, binders, or additives. Food of Life is hypoallergenic and packed inside easy to swallow VegiCaps. Keep your body fortified with the power of nature with Food Of Life. Spirulina: One of the most concentrated, nutritious foods on this planet. It is the highest natural source of complete protein. We use only organically-grown Spirulina. High amounts of sunshine make spirulina higher in beta carotene than any other plant. It is also a rich source of B-vitamins, especially B-12.Grown using water pumped from 2000 feet deep in the ocean, spirulina is one of the richest sources of minerals, also. One of the oldest types of algae, it has a soft cell wall for easy digestion and assimilation.Spirulina contains 60% protein and 18 amino acids. It has all 8 of the essential amino acids, and thus is considered to be a complete protein. These amino acids are vital nutrients to the human body and are necessary to sustain life, in contrast to animal sources of protein. It is an alkaline food, and consuming it can help reverse the damage of many bad aspects of the typical American diet. It is grown in Hawaii, in an area free from contamination and rich in minerals. Spirulina contains 92 trace minerals. It is high in vitamins, chlorophyll, phycocyanin, carotinoids, superoxide dismutase, RNA, DNA, beta carotene, and sulfolipids. Spirulina contains over 100 synergistic nutrients, and is nature’s richest source of nutrition. Chlorella: Chlorella Green algae that is an extremely concentrated source of nutrition. The cell wall has been cracked to make the nutrients more available and increase its digestibility. This is a single cell plant that gets its name from the amount of chlorophyll it contains. The high amounts of RNA & DNA in chlorella help repair damaged liver, colon, and other tissue, and combat viral illnesses. It is a powerful stimulator of tissue repair. It promotes the production of interferon, macrophages, and T-cells, which strengthen the immune system. It stimulates the production of red blood cells. It contains large amounts of chlorophyllase and pepsin, which are digestive enzymes. It is high in dietary fiber that binds with heavy metals such as mercury, cadmium, and lead, and pulls them out of the body. It has been used to detoxify those suffering from synthetic organic chemical toxicity. It is alkaline, and helps restore the body’s pH balance. It contains the entire B-complex, vitamin E, C, magnesium, zinc, folic acid, calcium, and potassium. Chlorella contains a wide array of free-form amino acids, and is 60% protein in an easy-to-assimilate form. Alfalfa Grass, Wheat Grass,Barley Grass: Mildly cleansing and the greatest sources of nutrition of any grasses. Grain grasses are more potent than the grains themselves, offering us a rich array of vitamins, minerals and chlorophyll. Barley grass is derived from young barley plants, which have a strong resistance to disease and fungus. Barley greens are also a superior source of chlorophyll, the nutrient-rich by-product of photosynthesis which makes plants green and is chemically similar to human blood. These grasses provide thirty times more vitamin B1 and calcium than milk, seven times more vitamin C than oranges. Purple Dulse, Kelp: The richest source of assimilatible minerals on the planet. They contain all the minerals and trace minerals found in the oceans and earth’s crust. Plants from the sea offer vast amount of nutrients not available to most people who consume only land-based plants. Bee Pollen: An excellent nutritional supplement for enhancing immunity and for providing energy. It contains up to 35 percent complete protein, as well as 22 amino acids, an especially rich storehouse of B vitamins, 27 minerals, trace elements and several enzymes. Spinach,Beet Root: Some of the richest, most assimilatible sources of organic iron. Beets, being a root vegetable and growing underground, change inorganic raw elements into plant minerals that are useful to humans. Spinach is a rich source of calcium, iron and vitamin K. Both of these plants are famous for their blood building ability.